It’s about the lives of the saints (like some other recent postings); it’s about Switzerland (for some value of Switzerland); and it’s about dogs, really big dogs. St. Bernard of Montjoux, and the dog named after his 11th-century refuge for travelers in the Alps. Previously on this blog: on 12/4, “Santa Barbara: smite him with lightning”; and on 12/5, “News for bears: St. Corbinian”. … The famous breed of St. Bernard dogs were named after the hospice as they were bred to help on rescue missions during winter storms. … Seeing the old pagan ways still prevailing among the people of the Alps, Bernard resolved to devote himself to their conversion. For 42 years he continued to preach the Gospel to these people and even into many cantons of Lombardy, effecting numerous conversions and working many miracles. In his office as archdeacon, Bernard had the charge of caring for the poor and travelers. For their convenience and protection, Bernard founded a canonry and hostel at the highest point of the pass, 8,000 feet above sea-level, in the year 1050, at the site which has come to bear his name. (#2) Great St. Bernard Pass (marked), in Switzerland. To the south of it, Italy; to the west, France. Little St. Bernard Pass is north of Bourg-Saint-Maurice, on the Italian-French border. At the top of the map: Neuchâtel, where Elizabeth Daingerfield Zwicky lived and worked for several years. And of course the capital city Bern(e), which might or might not involve bears etymologically, but has one on its coat of arms. A few years later he established another hostel on the Little St. Bernard Pass, a mountain saddle in the Graian Alps, 7,076 feet above sea-level. Both were placed in charge of communities of canons regular, after papal approval had been obtained by Bernard during a visit to Rome. 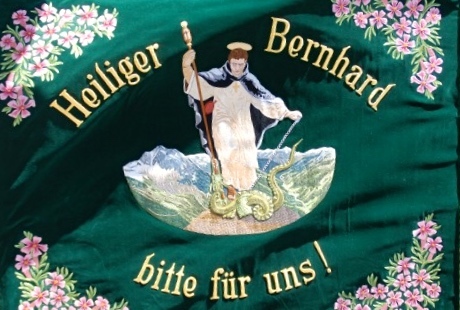 … Pope Pius XI confirmed Bernard as the patron saint of the Alps in 1923. His image appears in the flag of some detachments of the Tyrolean Alpine Guard. 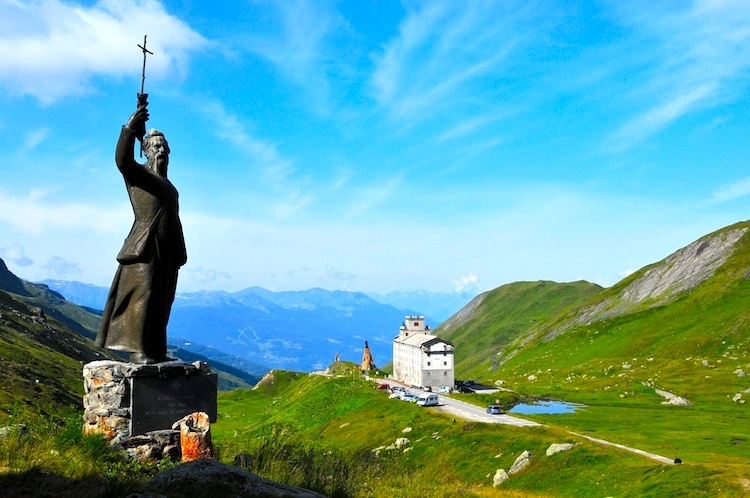 He is also the patron saint of skiing, snowboarding, hiking, backpacking, mountaineering. Great St Bernard Pass (French: Col du Grand St-Bernard, Italian: Colle del Gran San Bernardo, German: Grosser Sankt Bernhard; 2,469 m (8,100 ft)) is the third highest road pass in Switzerland. 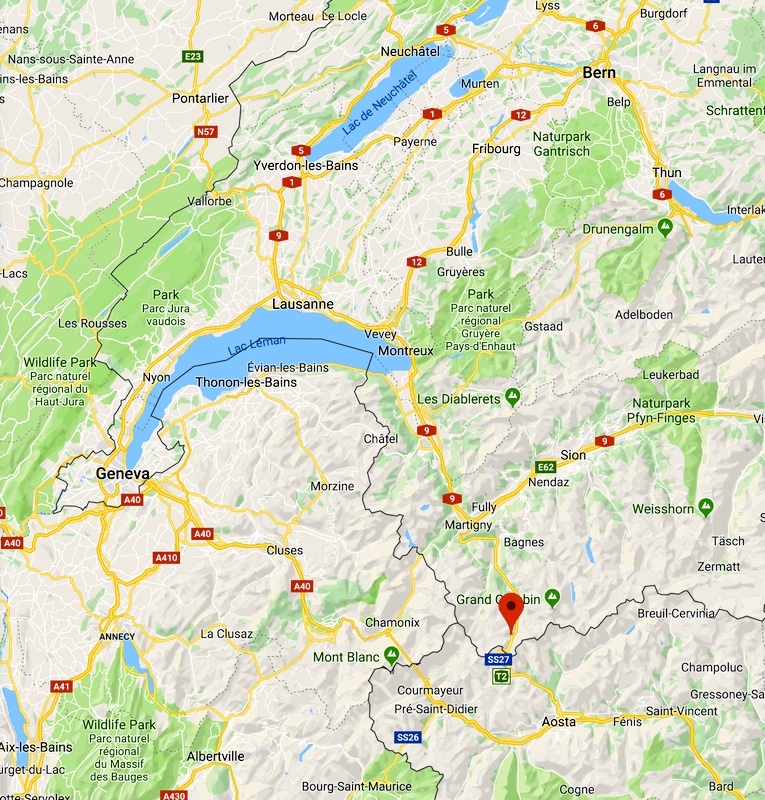 It connects Martigny in the canton of Valais in Switzerland with Aosta in the region Aosta Valley in Italy. It is the lowest pass lying on the ridge between the two highest mountains of the Alps, Mont Blanc and Monte Rosa. The pass itself is located in Switzerland in the canton of Valais, very close to Italy. It is located on the main watershed that separates the basin of the Rhône from that of the Po. Great St Bernard is one of the most ancient passes through the Western Alps, with evidence of use as far back as the Bronze Age and surviving traces of a Roman road. In 1800, Napoleon’s army used the pass to enter Italy, an event depicted in Jacques-Louis David’s Napoleon at the Saint-Bernard Pass and Hippolyte Delaroche’s Bonaparte Crossing the Alps, both notable oil paintings. Having been bypassed by easier and more practical routes, particularly the Great St Bernard Tunnel which opened in 1964, its value today is mainly historical and recreational. 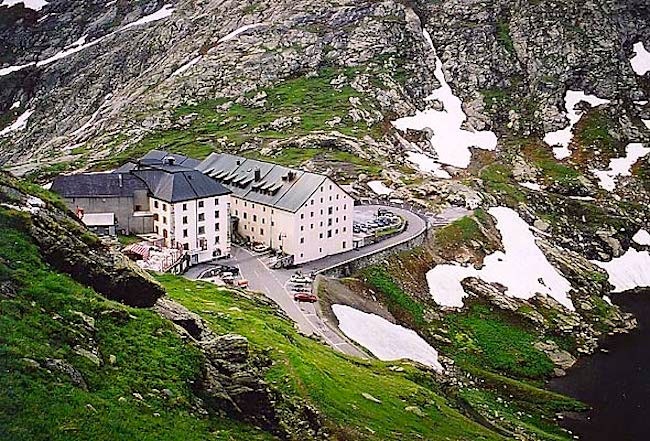 Straddling the highest point of the road, the Great St Bernard Hospice was founded in 1049. The hospice later became famous for its use of St Bernard dogs in rescue operations. The St. Bernard … is a breed of very large working dog from the western Alps in Italy and Switzerland. They were originally bred for rescue by the hospice of the Great St Bernard Pass on the Italian-Swiss border. The hospice, built by and named after Italian monk Bernard of Menthon, acquired its first dogs between 1660 and 1670. The breed has become famous through tales of alpine rescues, as well as for its enormous size. … The St. Bernard is a giant dog. The average weight of the breed is between 65 and 120 kg (140 and 260 lb) or more, and the approximate height at the withers is 70 to 90 cm (28 to 35 in). … The earliest written records of the St. Bernard breed are from monks at the Great St Bernard Hospice at the Great St. Bernard Pass in 1707, with paintings and drawings of the dog dating even earlier. … The modern St. Bernard breed is radically different than the original dogs kept at the St. Bernard hospice, most notably by being much larger in size and build. 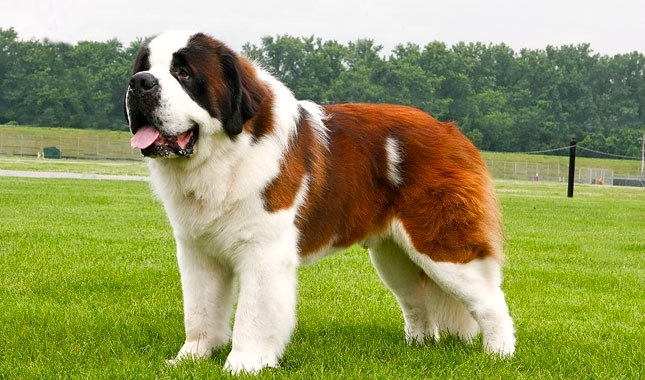 Since the late 1800s, the St. Bernard breed has been ever refined and improved using many different large Molosser breeds, including the Newfoundland, Great Pyrenees, Greater Swiss Mountain Dog, Bernese Mountain Dog, Great Dane, English Mastiff, and possibly the Tibetan Mastiff and Caucasian Ovcharka. Bernard of Clairvaux (Latin: Bernardus Claraevallensis; 1090 – 20 August 1153) was a French abbot and a major leader in the reform of Benedictine monasticism that caused the formation of the Cistercian order. “…[H]e was sent to found a new abbey at an isolated clearing in a glen known as the Val d’Absinthe, about 15 kilometres (9.3 mi) southeast of Bar-sur-Aube. According to tradition, Bernard founded the monastery on 25 June 1115, naming it Claire Vallée, which evolved into Clairvaux. There Bernard would preach an immediate faith, in which the intercessor was the Virgin Mary.” In the year 1128, Bernard attended the Council of Troyes, at which he traced the outlines of the Rule of the Knights Templar, which soon became the ideal of Christian nobility. In 1139, Bernard assisted at the Second Council of the Lateran. He subsequently denounced the teachings of Peter Abelard to the pope, who called a council at Sens in 1141 to settle the matter. Bernard soon saw one of his disciples elected Pope Eugene III. Having previously helped end the schism within the church, Bernard was now called upon to combat heresy. In June 1145, Bernard traveled in southern France and his preaching there helped strengthen support against heresy. After the Christian defeat at the Siege of Edessa, the pope commissioned Bernard to preach the Second Crusade. The last years of Bernard’s life were saddened by the failure of the crusaders, the entire responsibility for which was thrown upon him. Bernard died at the age of 63, after 40 years as a monk. He was the first Cistercian placed on the calendar of saints, and was canonized by Pope Alexander III on 18 January 1174. This entry was posted on December 5, 2018 at 7:06 pm and is filed under Language and animals, Language and religion, Switzerland and Swiss things. You can follow any responses to this entry through the RSS 2.0 feed. You can leave a response, or trackback from your own site. My first assumption on seeing the names Great St. Bernard Pass and Little St. Bernard Pass was that the adjectives applied to the passes themselves, one being bigger than the other. Thus I was surprised by the French name, which suggests that it’s the saint, rather than the pass, that is “great”.